When I found this artist I was excited by the way they work and interact with the public with the work and the way it is made and put on show. The work raises questions of what if, the work is playful and gets people to look at the material in a different light in a different space and engage with this in so many ways. Piece conceived for Fresh, a live arts and performance festival held at South Hill Park, Bracknell. 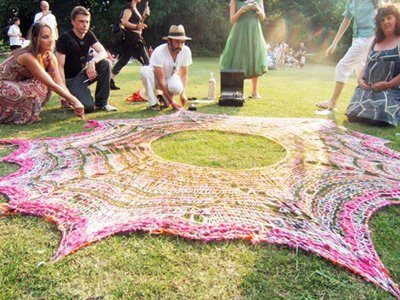 The day ended with stretching out the knitting on the lawn outside the arts centre. The piece was later included in the exhibition nEUclear reactions at the CAB in Burgos. 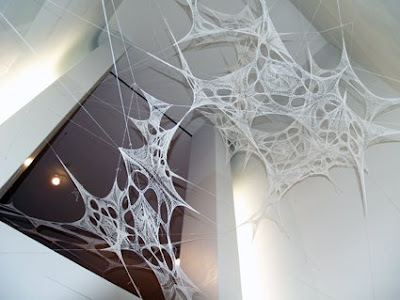 Second instalment of the World Wide Web 2007, a piece initially commissioned by the Museum of Arts and Design, New York, for the Radical Lace & Subversive Knitting exhibition in 2007. The piece will now be exhibited at the Indiana State Museum as part of the same touring exhibition from April 25, 2008. So with the love of recycled matirials and the investigation of plastics and video tape I have been looking at ways to construct shapes with the matirials. One way I have been looking in to was knitting, from that I have now been French knitting and have been ding do with a collection of home made spools. And on them knitting with plastics and video tape, I have found that it is a good way of seeing how the material works in a circular construction. 1: Thread the yarn through your spool knitter from top to bottom. 2: Cast on by winding your yarn around the nails in a anti-clockwise direction. Don't pull the yarn too tightly or you won't be able to knit your first round. 3: To knit, wind your yarn around the outside of the nails in an anti-clockwise direction. 4: Using a needle or pointed stick, lift the loop on each nail up and over the yarn wound around the outside of the nails. Continue working in an anti-clockwise direction until your cord is long enough. To cast off, cut the yarn and thread it through each loop. Pull tight to fasten off. After doing the drawing workshop a while back it has reminded me of natural elements that inspire me. The change of session's from winter, to spring have made a grate impact on how I see what inspires me. In the drawing workshop I found myself drawing the weds and flowers that grew through the concrete and stone. I have always been interested by the idea that nature will always push through, and how nature is stronger than we think. So recently I have been paying more attention the natural surroundings around me and taking photos of Biological weathering. I just find it fascinating that something can grow in the strangest of places such as on top of a wall because it has grown up through the cracks. It has made me think of the matirials that I use and relationship we link with things such as plastic bags, concrete and the natural environment. If a competently man made concrete building can work along side plants trees and nature and sit harmonise in the landscape. 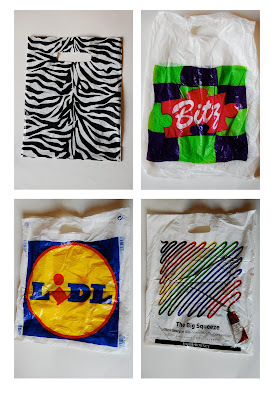 Why cant the everyday carrier bag for example be recreated from wast to do a similer thing. I am Becoming more and more interested in the idea of creating something for space which could be in or out side that then in turn has its own biological weathering. The waste that I collect I am trying to place them in different surroundings environments to see what the reaction would be. Both in a human sense and a biological seance. To create a vessels for growth or a sculpture for space that worked with or around nature is really important to me. This mirrors the idea in some ways of working within restrictions or growing within restrictions, but creating the restrictions for growth. In the same way this unpredictably happened when i broke my wrist. Biological weathering as part of my inspiration . . . . .
Labels: My Photography, Thoughts. . . .
Materials. . . . .
Because I collect so many waste matirials I need to organize then in a way that helps me work. For creating files for pacific things helps to keep track of all that I do, one of which is a file that helps me log all the things which I find I can work with. The matirials I have been preparing recently have been plastic bags, I have always used plastic bags but recently I have been logging the different types that I have found. I felt this was important to have a databases of the different types of bags as most of them seem to get lost within what it changes in to after working with it. This is part of my workspace, i have organized it in a way that helps me work , putting things into categories. . . . Here you can see the two main elements of my work at the momment plastic bags and the work with video tapes . . . . . . I collect all shapes, sizes and colours of different types of plastic bags. some of which I have lots of and some of which i have the odd one or two. This is why it is extremely important for me to make a log of all the matirials that I can use, some plastic bags might be limited edition ones which I may never see again. and so I take a photograph log of them . . . . . . Some of the bags are thinker than others and have obvious pattern on them with bright stand out colours. Some just serve the purpose are mass produced and are so much more thinner . . . I love the plastic bags which are different interesting , ones that have interesting designs on or that are one of few or for special occasions .. . . . . I find that I work more with the throw away bags as i feel they have not as much sense of value so many of them get made an thrown away each day it seams more appropriate for me to use them. The bags which I class as being rear or one off's with interesting designs I like to keep and treasure them for what they are. I briefly looked at making quick jewellery from my stretch video tapes thinking of ways people can to this for themselves. so I have been practising myself to see what sort of immediate jewellery i could make that would be easy for others to do all so. So by starting with the video tape thread i have made already I then look at making the tape in to rings by wrapping the tape around my finger and knotting different knots around the tape to give them different shapes I have also added buttons and doubled the amount of times I wrapped it on some.. . . . . . I then thought that if I can do this with rings then i should try it with bracelets so I did and I added some cable ties to hold them together. . . . . I have also looked at making the thread into beads by rolling and shaping the video take into bead like shapes and then stringing them on to a suppurate piece of thread. . . . . .
Other ways I have looked at making necklaces was by creating knots in the thread the knots look like flowers. I did this many times and then linked it together and doubled the pieces up to create a necklace. . . . . . . I also like them as just hangings instead of just a necklace and they can be as big or as small as i like them to be . . . . . . . . I thought I would just take some time to reflect on the work I have been doing so far and my thoughts at this point. . . . . . I am wanting to create LARGE SCALE objects for the decoration of open space. Insulations that people can engage in, touch walk around and experience the objects. I feel this will make much more of an impact if it were large scale objects, shapes, forms. I have been mainly preparing my found waste matirials, organising what I can do with what. sorting through all the plastic bags I have to use and logging them. I have been going through all the video tapes I have logging the different types that I have, organizing them to b used for different things... . . . . I have been making the the video tape and plastic bags in to a thread form so I can use it to knit with and stitch, from this i have been making samples to understand the matirials properties; what will work and what will not work. I have been creating my own French knitting contraption so I can create small but also large scale French knitting and thinking of ways to shape and place the finished piece. Constantly sourceing matirials as well as organising them and preparing them to be transformed in to something other than what it is. . . . . . . These are some of the drawings That did out side, they are not as detailed as they could be as I was timing myself as I was drawing. All from the secret Garden. This drawing above has been drawn in the space of 4 minuets I also took a photo of what I was drawing fr my own record. A old water tap out side the old green house in the secret garden. This drawing took about 8 minuets i stayed in the same spot but just turned to a different direction to draw what was in from of me, in this image it was Emma some trees and part of the old green house . This is some daffodils which were scattered all over the secret garden with the odd blue bells in inbetween them, this drawing took 2 minuets. This drawing was of a stack of old bricks all part broken and discoloured but they had lots of things growing from them in the cracks. This drawing took about 6 minuets to do. This was also the last drawing that I did and it became quite important to me as it reminded me of how natural elements, nature plants things which have life and grow are considerably important to me. The fact that these bricks had just been stacked and left for a while to weather had created the perfect spot for things like weds to attach them self onto and grow. I am so inspired by this type of growth, how nature will still fight on and grow around what ever has been dumped in her way. We create boundaries for mother nature and yet she will still find the odd crack to grow from, I have always been inspired by working within my own boundaries and constants and it is refreshing to see it from a more natural point of view. such as weds growing through concrete. Plus it reminds me of what is important to me. . . . . . . . . . . .
As part of our MA we had a drawing workshop that involved lots of different ways of drawing and sketching. The workshop was to get the group comfortable with drawing . I felt that I was OK with the idea of drawing as was already a big part of my work anyway, and more so after i broke my right wrist as it was incorporated with in most of my work and way of working anyway. Although I enjoy working as a group and I enjoy drawing and learning new ways of drawing so the drawing work shop could prove to be quite useful . . . . . .
We did a series of different timed drawings together, drawing just lines of what we could see straight in front of us in the space of 8 minuets . I quick drawing of the objects which had been placed in front of us but drawing it in the space of time of 4 minuets and drawing with a continues line not taking the pen off the paper. We all used mainly charcoal for the group drawing which was drawing what we could see from behind us. we had to communicate with the people ether side so that the drawing worked well and linked . I found the experience fun and enjoyed it. We then worked on a large scale drawing as a group where we drew what was behind us so it was almost from memory but not at the same time i have never done this before and it was fun to see us all working as a group and creating something on a large scale drawing. In the afternoon we all took our sketch books and drawing implements and went to the secret gardens and done some timed drawings and then focusing on certain spots and drawing them. I think that this was the most important part of the day as it reminded me just how important out side and natural element pay an important part in my work. I think that it is important for me to remember this and eqknolege the fact that this is so important within my design development. . . .